As a model train maker, I use a lot of aircraft plywood for the bodies. The plywood I use is 3 ply, 1/16” thick. Cutting it to size is no problem as I can cut it with a saw. Cutting window and door openings is a problem. I layout the openings accurately with a thin lead and cut the outline. Openings are around 1”x 1” up to around 3”x 5”. I have used all kinds of sharp knives and razor blades, but it is tough going. I wonder if there is a tool that would cut clean openings in 1/16” plywood. I’ve thought about using a jewelers saw, but that may cause tear out. I’ve even tried drilling overlapping holes and cleaning up the opening with sanding sticks, chisels and razor blades. I just discovered a new product called “Wonder Cutter” that cuts using ultrasonic technology; cost $400; not an option. Maybe someone has an ingenious way of cutting; please let me know. I wonder if the tiny circular saw blades they make for the dremel rotary tool would work. Or maybe the diamond or carbide cut-off wheels like this or this. Or, maybe exacto saw blades. I just thought about an oscillating multi tool before reading the replies. I think I will try one. Any recommendations on the least expensive and reliable brand? HF, Worx, Dremel, Fein, too expensive. Was going to suggest a small laser cutter, but they are around $350-$400 also. Use a SCROLLSAW—WITH A many TOOTH ( 25 + TPI) blade AND ALSO TAPE BOTH SIDES OF THE CUT! EXPERIOMENT A LITTLE ON WASTE STOCK TO GET THE FEEL—RIGHT SPEED ETC. ! Let us know please what worked best for you. b If you do not have a scrollsaw and go to buy one——VARIABLE speed is a MUST! Scroll saw….2/0 blade….28 tooth per inch. Or a sanding drum in the drill press , rough the hole then finish sand with a drum. Get some really cheap 1/4” plywood and sandwich your 1/16” stuff between the 1/4 sheets and make the cut, any tearout will be in the 1/4” stuff. You can use double sided scotch tape to hold the layers of plywood together. Scroll saw is my vote as well… Though I think the #1 key overall is taping both sides as ralbuck points out. If you don’t want to spend the money on a scroll saw, tape both sides and use a dremel and a cut off wheel. Scroll saw with a #1 ultra reverse blade. Note that it may take some practice to cut a straight line. You might borrow techniques used for marquetry. Look at what Shipwright is doing in his various post and forum topics. You might glue the plywood to another substrate with hide glue. Hide glue is reversible. Or maybe sandwich the plywood between two (thin) cardboard sheets with hide glue. The paper/cardboard and hide glue would be easy to scrap with the help of some water (if you plywood has enough water resistance). An oscillating cuter from Harbor Freight will cost you under twenty buck to try. I’d go that route before investing in a scroll saw. 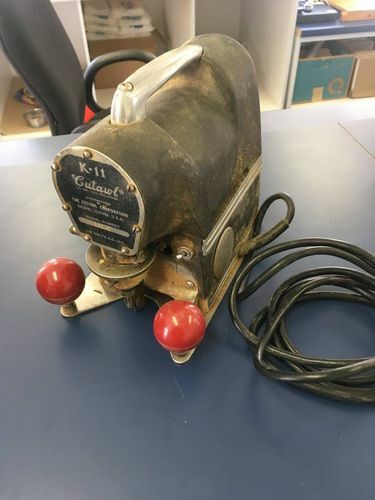 One of these old signmakers cutters always seemed interesting to me but I don’t know how much control you would have on the really small stuff. They show up n CL or ebay frequently.